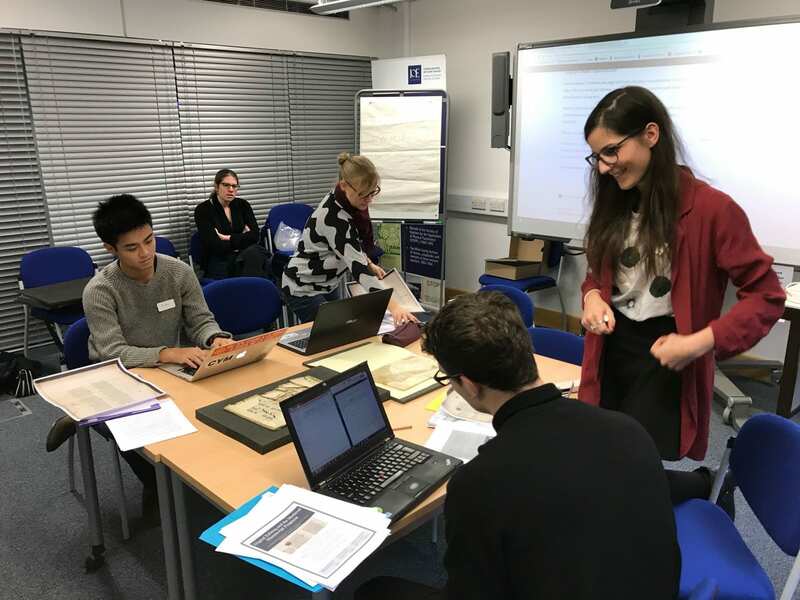 On Friday 9th February, I attended a day course ‘Managing Photographs in the Archive’, run by The Archive-Skills Consultancy Ltd (http://www.archive-skills.com/) presented by Margaret Crockett, Janet Foster and Dr. Jessamy Harvey. Attendees from as far afield as Singapore and the Western Isles were present, and the day started by defining what archives are, and when photographs might be considered archives. 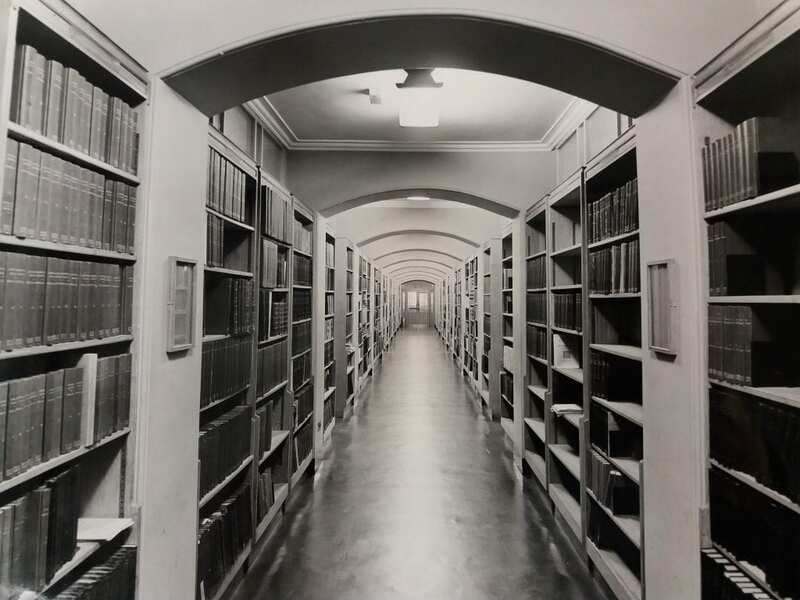 UCL Special Collections holds a wide range of photographs, including those donated to us from other UCL departments (Estates, Development Office, as well others that no longer exist). 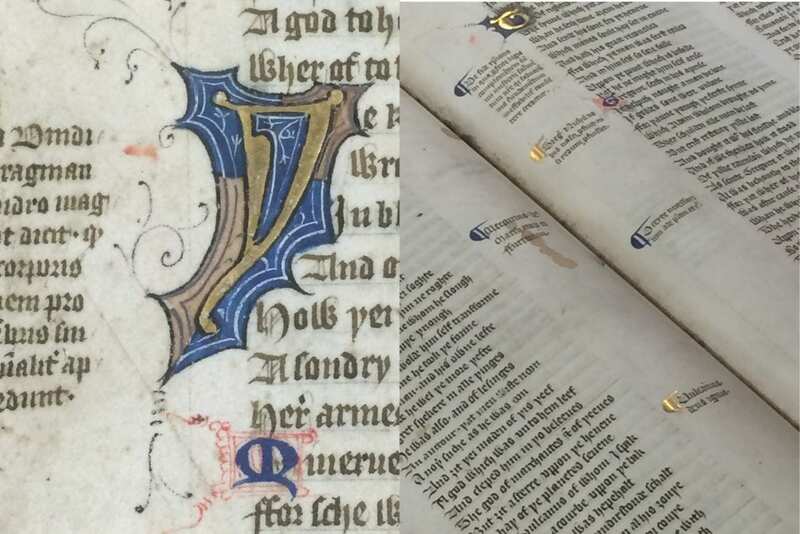 Whilst we have begun to survey them, a great deal more work is necessary to better streamline and catalogue what photographs we have and in what format. Context is vital in determining when photographs are considered to have archival value, and we have a great number that do not have any accompanying documentation, annotations or dates. We also have multiple photographs of the same event or royal visit (just how many photographs of Princess Anne do you need? ), and photographs of staff parties from 20 years ago that are not of archival value, no matter how interesting the clothes or hairstyles might be. The photograph above is not dated, but does however have information on the reverse relating to who took it. Looking more closely at the buildings and doing some research online, we may be able to determine when it was taken. 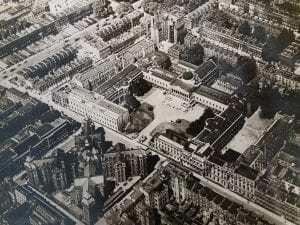 Also, in this circumstance, we know that it is an aerial photograph showing the Wilkins Building, Gower Street frontage and what is now the Cruciform Building. Other photographs we have are a little more difficult. We have several boxes of albums of various events (dinners, farewell parties, receptions) all donated from the Secretary’s Office. In some, but not all cases, the albums are labelled with the particular event. However, we do not know who took the photos and a lot of dedication will go into finding out who everyone is. This leads to further questions, such as is it really worth keeping photographs of staff leaving parties? 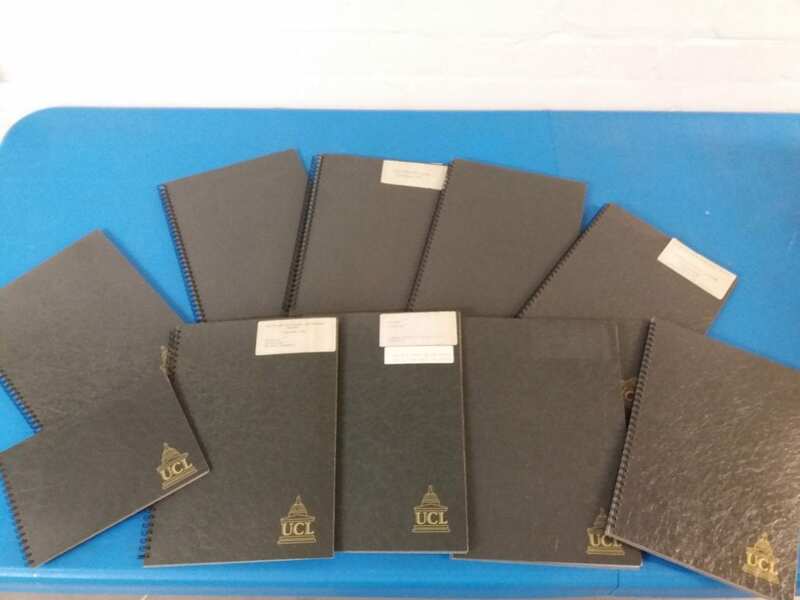 Photo albums donated by the Secretary’s Office for various events held in 1989. One of the most interesting and challenging sessions during the day was Identifying Photographic Processes, including ambrotype, daguerreotype and tintype. Identifying the historical photographic process is essential for preservation, as each format has its own characteristics, and using appropriate packaging is vital. Furthermore, identifying the process can be extremely useful for dating the photograph when no other information is available. We were fortunate to have the use of pocket microscopes (retailing at a very reasonable price so I was told) to identify the layers of photographs and see if paper fibres were visible on magnification. One could also look at any damage such as fading or abrasion. Our final morning session looked at preservation, including the packaging, storing and handling of photographs, and I sensed that I could easily spend what is left of our budget on enclosures, four flap folders and more Melinex. 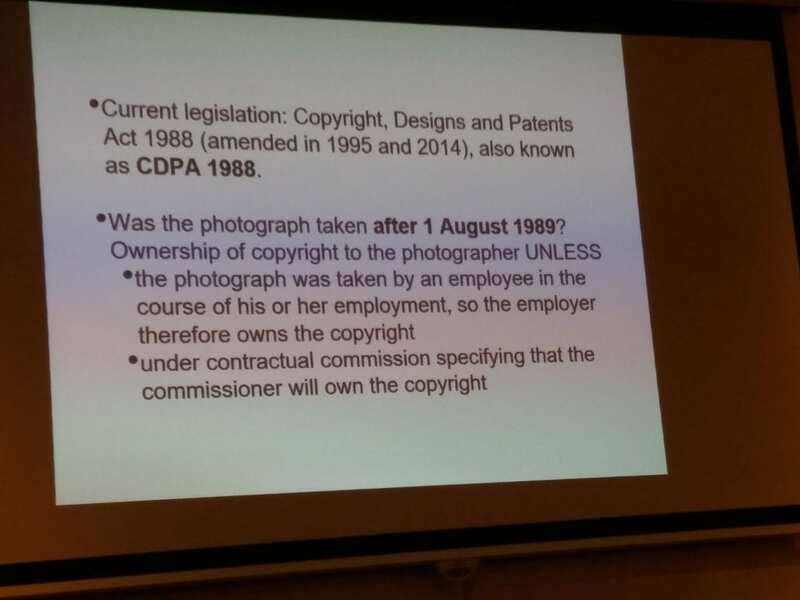 Slide from Copyright session, reproduced with permission of The Archive-Skills Consultancy Ltd. The afternoon session on Managing Copyright in Photographs was of most interest. I find copyright a complex area at the best of times, but it seems more intricate relating to photographs. The session covered copyright ownership, copyright duration, photographs of known and unknown authorship and due diligence. The session outlined the main issues facing archivists with dealing with copyright, and highlighted a lot of further reading and case studies, which will be most useful. Copyright in general is something that I feel I need to learn more about, particularly with the enquiries we receive regarding the use of our images. Overall, the day was most enlightening, with a lot of content to take on board. Managing our photographic collection is one of my priorities for the year ahead. 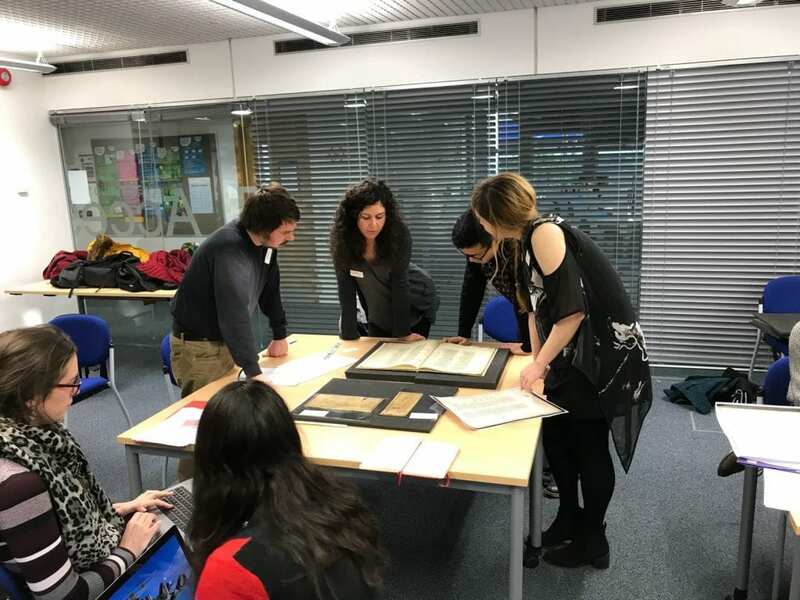 This will include surveying what we hold, appraising and weeding the photographs held by UCL Records (an awful lot of weeding) and and ordering preservation material for photographs where necessary. Main Library from 1965-66. Photo by Associated Graphic Arts, from an album donated from the Provost’s Office.